Student-centred learning (SCL) is an approach to education, which aims at overcoming some of the problems inherent to more traditional forms of education by focusing on the learner and their needs, rather than being centred around the teacher's input. This approach has many implications for the design and flexibility of curriculum, course content, and interactivity of the learning process and is being increasingly used at universities across Europe. The concept of SCL was initially a theoretical model defined as such by pedagogy and education researchers, though attempts at empowering the learner to enhance the educational process have probably always existed wherever educators have strived to improve and reform. Student-centred learning is not among the thematic areas that have been tackled directly in the Bologna Process from the onset. However, many of the priority work plan themes discussed early on in the Bologna Process tackled aspects that helped make learner-centred education more of a reality. This included flexibility tools such as ECTS, mobility, improved recognition, qualification frameworks and others. Also, parts of the ministerial conference communiques reaffirmed the importance of the educational mission of universities. Student-centred learning was fully taken into the process during the Leuven/Louvain-la-Neuve ministerial conference, in 2009. This constituted an important reassertion of the teaching mission of Higher Education, which – while central to the creation of a coherent European Higher Education Area – had been often overlooked in the development of the Bologna Process. We reassert the importance of the teaching mission of higher education institutions and the necessity for ongoing curricular reform geared toward the development of learning outcomes. Student-centred learning requires empowering individual learners, new approaches to teaching and learning, effective support and guidance structures and a curriculum focused more clearly on the learner in all three cycles. Curricular reform will thus be an ongoing process leading to high quality, flexible and more individually tailored education paths. Academics, in close cooperation with student and employer representatives, will continue to develop learning outcomes and international reference points for a growing number of subject areas. We ask the higher education institutions to pay particular attention to improving the teaching quality of their study programmes at all levels. This should be a priority in the further implementation of the European Standards and Guidelines for quality assurance. With the Bucharest Communiqué (2012), the Ministers reiterated their committed to “Establish conditions that foster student-centred learning, innovative teaching methods and a supportive and inspiring working and learning environment, while continuing to involve students and staff in governance structures at all levels”. In the Yerevan Communiqué (2015), the Ministers confirmed that "Enhancing the quality and relevance of learning and teaching is the main mission of the EHEA." "We will encourage and support higher education institutions and staff in promoting pedagogical innovation in student-centred learning environments and in fully exploiting the potential benefits of digital technologies for learning and teaching." 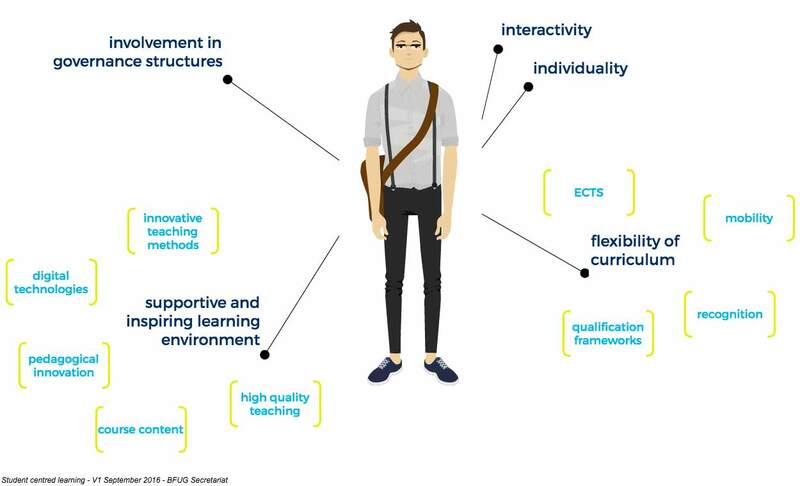 European Students Union (ESU) research study on Overview on Student-Centred Learning in Higher Education in Europe was developed as part of the Erasmus+ project, PASCL (Peer Assessment of Student Centred Learning). Through the research done in this publication on the grassroots level by surveying students and higher education institutions and gathering the different policies of essential European stakeholders, there are clear signs of progress in the implementation of SCL. Its authors have also identified a plethora of different perspectives on what SCL is and where to go from here.